Marmite is a thick, black yeast extract product. Around 25 million jars are sold every year. Marmite was invented by German scientist Justus von Liebig (1803 – 1873) in the late nineteenth century. The Marmite Food Extract Company was incorporated in Britain in 1902, headed by a retired Swiss sugar merchant called Frederick Wissler. Marmite was initially produced at Mincing Lane, London. By 1906 production had been relocated to a disused malt house at Cross Street in Burton upon Trent, and a Mr Schmidt was manager of the company. Mincing Lane House, London, became the company headquarters. As a centre of British brewing, Burton provided ample supplies of yeast, the principal ingredient of Marmite. The product’s reputation grew as a health product, and during the First World War it was added to soldiers’ rations to prevent Vitamin B1 deficiency. Following the death of the company’s first chairman, Marmite was acquired by Bovril in 1924. A second factory was opened at Vauxhall, London, in 1927. The Burton factory relocated about a mile to Wellington Road in 1952. The Vauxhall factory closed in 1967. A new factory to produce both Bovril and Marmite was opened in Burton upon Trent at a cost of £1 million in 1968. The factory employed 450 people. 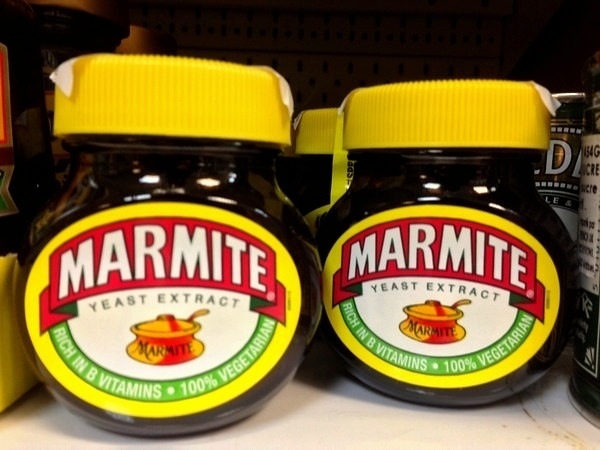 Unilever, the Anglo-Dutch consumer goods company, acquired Marmite in 2000. 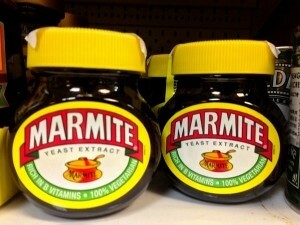 A less viscous version of Marmite was launched in squeezy bottles in 2006. The Burton factory produces 25 million jars of Marmite every year as of 2015. Around 15 percent of the total is exported, mostly to former British colonies. Sri Lanka is a major market, where it is mixed into porridge. A mixture of ale and lager yeasts are used to create Marmite. Much of the yeast is still sourced from the Molson Coors (formerly Bass) and Marston’s breweries in Burton. The automated factory employs around 60 people. Before distribution, Marmite is matured for seven days.